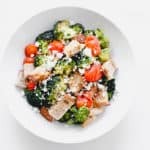 Author: Excerpt from The 30-Minute Mediterranean Diet Cookbook: 101 Easy, Flavorful Recipes for Lifelong Health, published by Rockridge Press. Copyright © 2018 by Serena Ball, MS, RDN, and Deanna Segrave-Daly, RDN. Place a large, rimmed baking sheet in the oven. Preheat the oven to 450 degrees F with the pan inside. Put the broccoli in a large bowl, and drizzle with 1 tablespoon of the oil. Toss to coat. Carefully remove the hot baking sheet from the oven and spoon broccoli onto it, leaving some oil in the bottom of the bowl. Add the tomatoes to the same bowl, and toss to coat with the leftover oil. Toss the tomatoes with 1 teaspoon of honey, and scrape them onto the baking sheet with the broccoli. Roast for 15 minutes, stirring halfway through. Remove the sheet from the oven, and add the bread cubes. Roast for 3 more minutes. The broccoli is ready when it appears slightly charred on the tips and is tender-crisp when poked with a fork. Spoon the vegetable mixture onto a serving plate or into a large, flat bowl. In a small bowl, whisk the remaining 2 tablespoons of oil together with the vinegar, the remaining honey, and the pepper and salt. Pour over the salad, and toss gently. Sprinkle with cheese and oregano, if desired, and serve. Cheese not calculated into analysis. Feta used in current recipe photo.